September 18, 2013 JAPAN, Tokyo- Ugoku/Ugokasu (GCAP Japan), Japan's civil society network against global poverty, handed in its "5 Key Policy Recommendation for the Post-2015 Development Agenda" to Dr. Toshiko Abe, Parliamentarian Vice Minister of Foreign Affairs Japan on Wednesday. Ms. Naoko Tsuyama, the president of GCAP Japan submitted the paper to Dr. Abe in her meeting with the 17 civil society representatives and academics working on disability, environment and international development for the UN MDGs Special Event, which will be held in New York on September 25. 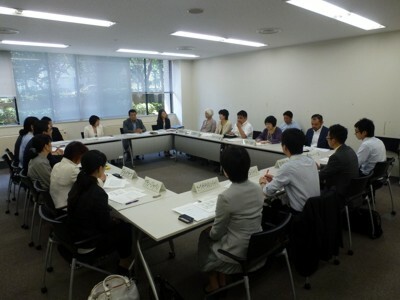 The Recommendations was composed through national consultation organized by GCAP Japan from last February to May, that was a series of meetings with local civil society organizations, religious organizations, trade unions and private sectors on Post 2015 Development Agenda. 67 organizations from various social sectors, including Scout Association in Japan, Girl Scout in Japan and World Conference of Religions and Peace Japan Committee (WCRP-JC), signed the Recommendations. It urges Japanese government and other global powers to set goals to eradicate extreme poverty and hunger, realize the world without disparity and inequality, pass on more sustainable "a better world" to future generations, etc. Dr. Abe replied the representatives of Japanese civil society by raising the following 3 points; first, she requested representatives of Japanese people with disability to attend the World Conference on Disaster Reduction, which will be held in Japan in 2015, and raise voices representing people with disability. Secondly, she emphasized the importance of the redistribution of wealth through social protection and welfare. Picking up Universal Health Coverage as an example of redistribution in the health issues, she said that finding concrete measures of redistribution was an urgent issue. The third point she mentioned was the human resource development. She asked representatives of civil society to collaborate with universities to develop human resources for international development. The representatives of Japanese civil society, including GCAP Japan commended Dr. Abe's comments as her positive reseponses for the efforts of policy recommendation from civi society. The representatives of civil society expressed their will to work with the government for the UN MDGs Special Event.